Mystified residents have been baffled by empty milk bottles appearing on their doorsteps for months with intricate art etchings created by an artist that’s been dubbed as ‘Pic-glasso’ and ‘Bottle Banksy’ after the enigmatic guerilla graffiti artist whose work appears overnight on buildings across Britain that continually escapes unseen. 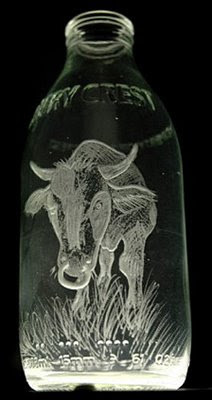 When homeowners have gone to grab milk left from the dairyman to sit down to their morning java, they’ve been surprised to find the bottles replaced with an extra empty engraved with images of cows, mice, farmyard scenes and animals into the glass with incredible detail, and the artist long gone. 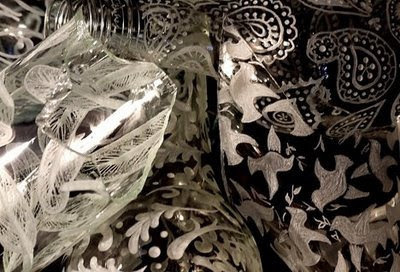 The bottles started appearing mysteriously at homes in Stourbridge, West Midlands, and surrounding villages last spring, much to the delight of the homeowners, but the identity of the artist remained unknown. 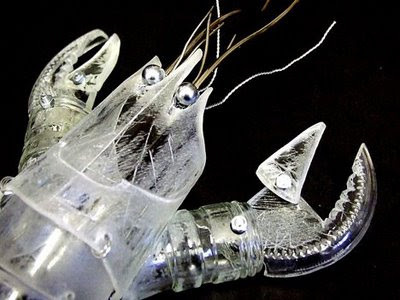 “I had heard something about this from a friend, but nobody knows who is doing it.” said Jackie Dimock, who discovered one of the bottles on her doorstep on Monday. “I was putting out the empties and I noticed there was an extra one on the doorstep.” she said. 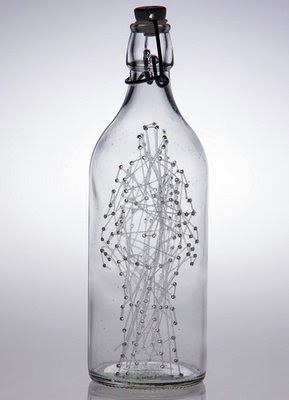 Some of the bottles are left out for refilling and distributed to other homes, but many have been kept as souvenirs or artworks by thrilled residents, and others have even been traded on internet auction sites. 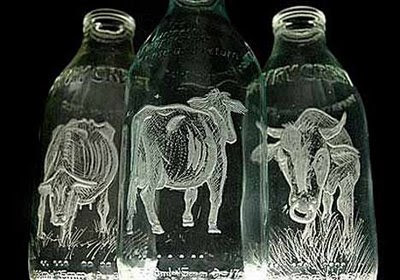 But unlike the ever-elusive Banksy, the artist’s identity behind the milk bottle creations has been revealed as Charlotte Hughes-Martin. 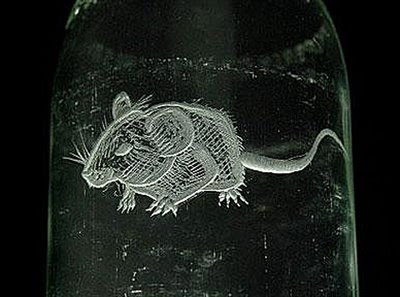 The 30-year-old artist painstakingly engraves the bottles with her own designs — some serious, and others humorous. 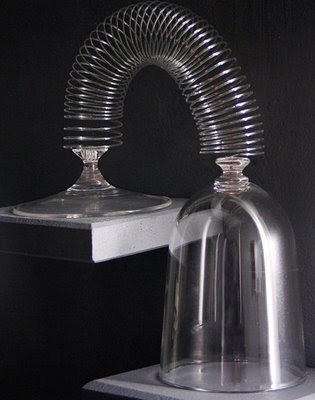 Once completed, she returns the bottles to random doorsteps in the area, where they’re collected for refilling. 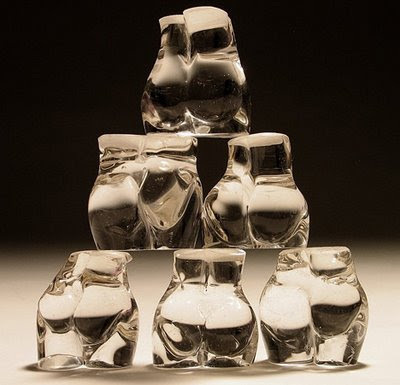 Originally from Cheshire and currently based at the Red House Glass Cone in Wordsley, Stourbridge — a former glass factory — Charlotte uses a variety of techniques, materials and styles to engrave the bottles, taking her inspiration from everyday life. 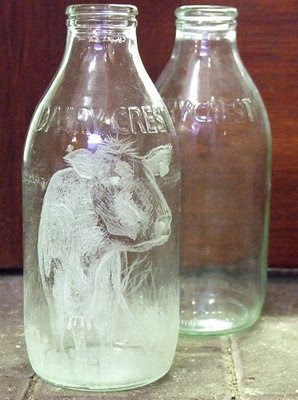 And fittingly, many of her etchings are milk related or feature cows. 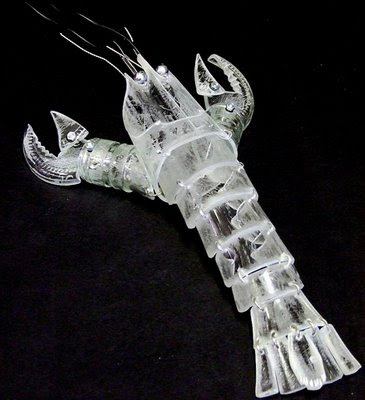 Two pieces of her work had been short-listed for the prestigious national Glass Biennale prize.